The rPI is normally set to Read-Only which means that the file system cannot be changed. This ensures that if power is removed without first shutting down the rPi the file system isn't corrupted. 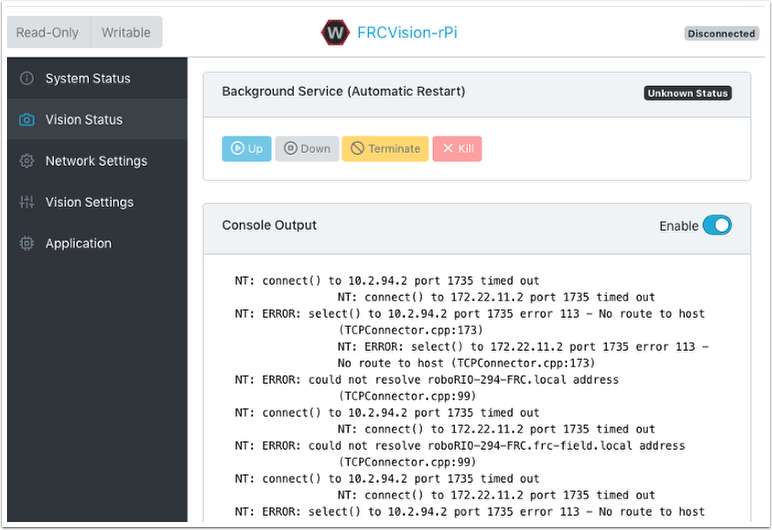 When settings are changed (following sections), the new settings cannot be saved while the rPI file system is set as Read-Only. Buttons are provided that allow the file system to be changed from Read-Only to Writable and back whenever changes are made. If the other buttons that change information stored on the rPI cannot be press, check the Read-Only status of the system. There is a label in the top right corner of the console that indicates if the rPi is currently connected. It will change from Connected to Disconnected if there is no longer a network connection to the rPi. CPU usage for user processes and system processes as well as idle time. And network bandwidth - which allows one to determine if the used camera bandwidth is exceeding the maximum bandwidth allowed in the robot rules for any year. DHCP - the default name resolution usually used by the roboRIO. The default name is raspberry.local. The picture above is showing the settings for both DHCP and Static IP Addressing. The mDNS name for the rPi should always work regardless of the options selected above. 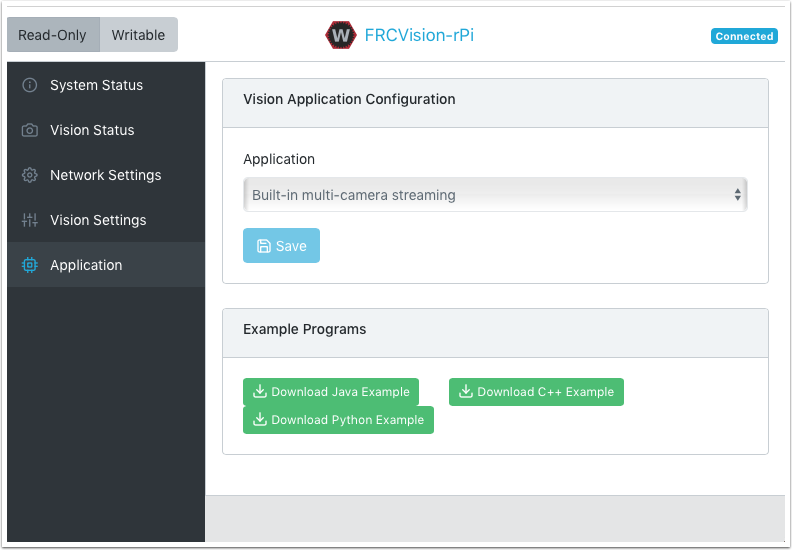 The Vision Settings are to set the parameters for each camera and whether the rPI should be a NetworkTables client or server. There can only be one server on the network and the roboRIO is always a server. Therefor when connected to a roboRIO, the rPI should always be in client mode with the team number filled in. If testing on a desktop setup with no roboRIO or anything acting as a server then it should be set to Server (Client switch is off). To view and manipulate all the camera settings click on the camera in question. In this case the camera is called "Camera rPi Camera 0" and clicking on the name reveals the current camera view and the associated settings. Manipulating the camera settings is reflected in the current camera view. 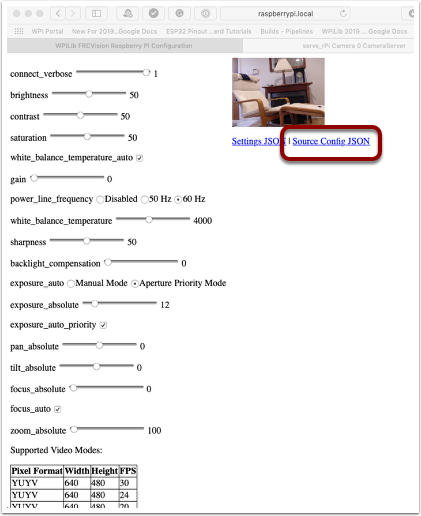 The bottom of the page shows all the possible camera modes (combinations of Width, Height, and frame rates) that are supported by this camera. The rPi will load all the camera settings on startup. Editing the camera configuration in the above screen is temporary. 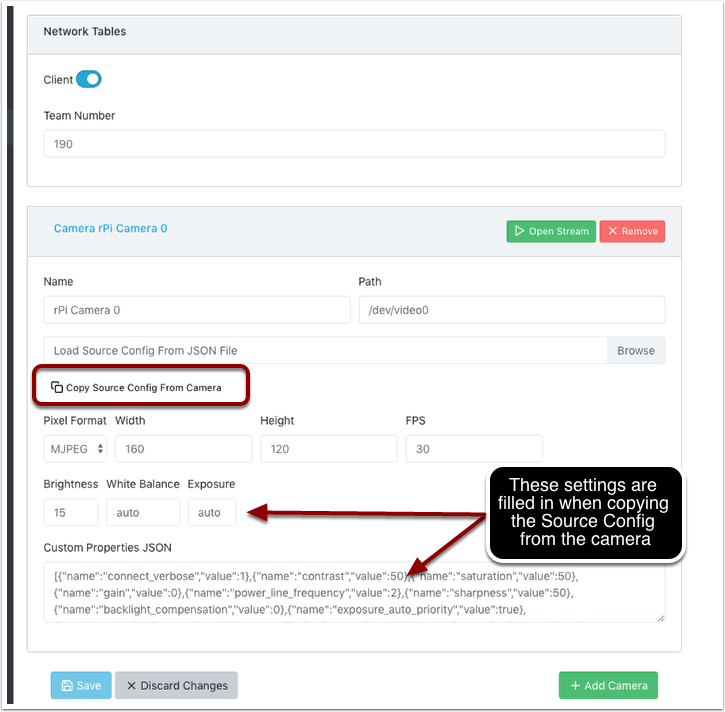 To make the values persist click on the "Load Source Config From Camera" button and the current settings will be filled in on the camera settings fields. Then click "Save" at the bottom of the page. Note: you must set the file system Writeable in order to save the settings. The Writeable button is at the top of the page. There are some commonly used camera settings values shown in the camera settings (above). These values Brightness, White Balance, and Exposure are loaded into the camera before the user JSON file is applied. So if a user JSON file contains those settings they will overwrite the ones from the text field. The Application tab shows the application that is currently running on the rPi. Built-in multi camera streaming which steams whatever cameras are plugged into the rPi. 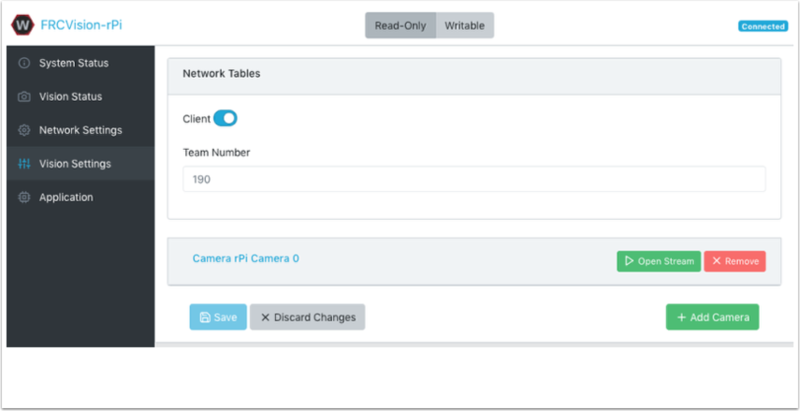 The camera configuration including number of cameras can be set on the "Vision Settings" tab. Custom application which doesn't upload anything to the rPi and assumes that the developer wants to have a custom program and script. Java, C++ or Python pre-installed sample programs that can be edited into your own application. Java, C++, or Python uploaded program. Java programs require a .jar file with the compiled program and C++ programs require an rPi executable to be uploaded to the rPI. 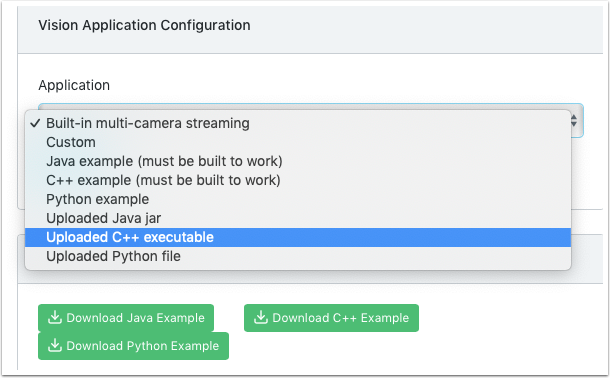 When selecting one of the Upload options, a file chooser is presented where the jar, executable or Python program can be selected and uploaded to the rPi. 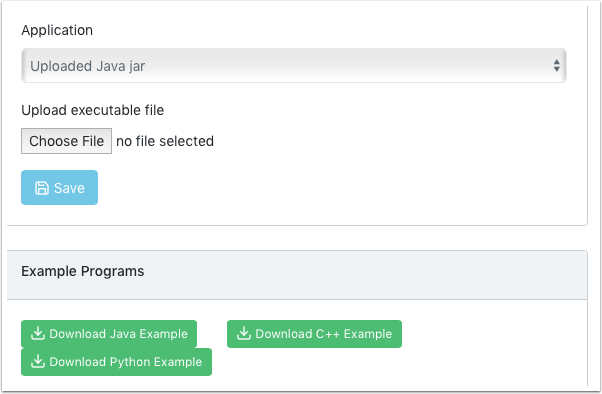 In the following picture an Uploaded Java jar is chosen and the "Choose File" button will select a file and clicking on the "Save" button will upload the selected file. 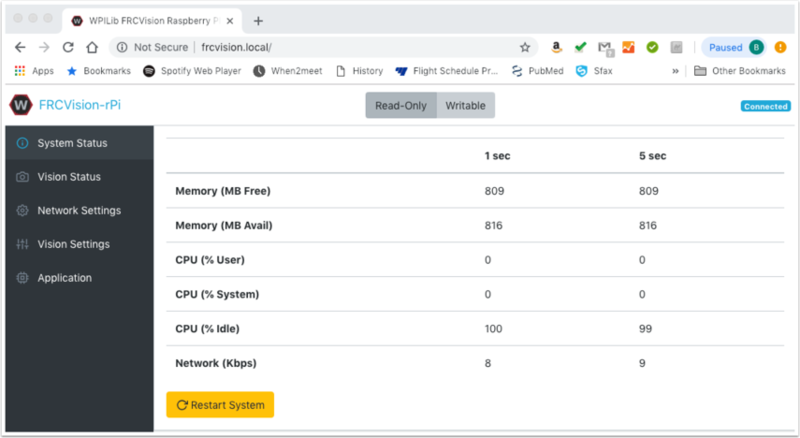 Note: in order to Save a new file onto the rPi, the file system has to be set writeable using the "Writable" button at the top left of the web page. After saving the new file, set the file system back to "Read-Only" so that it is protected against accidental changes.